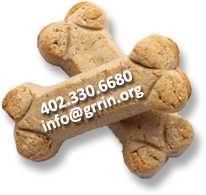 Dear GRRIN, We wanted to inform you of the passing of Rex (99-01) on October 23, 2009. I got Rex in the spring of 1999 and he became a very dear member of our family for the past 11 years. Having just recently graduated from college at the time, I had purchased a home in my old neighborhood, living near to my parents place. I had never had a pet of my own, but had always wanted a one, so I decided to pursue an adoption from GRRIN. Katie Burks and another volunteer helped me to match me up with Rex. Me and the friends who were my roommates at the time welcomed Rex into our home becoming one of the guys. Rex always loved attention, but was very well-behaved, never getting on the furniture or making much of a mess in the house. If he had a flaw, it was that he did shed quite a bit, which was a major complaint of the previous owners who surrendered him to GRRIN. For me, it was just a small price to pay for the great friendship and love that he shared with us for 11 years. Rex did have a thing for thunderstorms, especially at night. Still, I did manage to figure out that if he hung out on the bathroom floor with the lights on, it would help calm him enough that he would relax. Unfortunately this fear did equate into a fear of flash cameras. I usually had to trick Rex into getting his picture taken, since he would run from the sound of turning a digital camera on. With the advent of camera cell phones I was able to get more pictures of him, but for the majority of his life, pictures of Rex were a rare, but much treasured treat and keepsake. During that time, my dad would come over often to tend the large garden we had in my back yard in his retirement. From my dad’s frequent visits, Rex and he became best friends, essentially becoming Rex’s “Grandpa”. Like most grandpas, dad would dote on Rex by spoiling him with people food treats even if I didn’t necessarily condone it. Oddly, his favorite people food treat was apples that my dad would cut up and share with him on the back porch or put in his food bowl. My dad also loved grooming Rex and brushing his teeth, probably to the point of overdoing it, but Rex would just proudly sit get pampered by Grandpa. My dad also loved taking Rex on a lot of extra walks through the neighborhood helping him to stay happy, fit and content. Rex being the smart boy he was, would often be let loose a block away from the house. You would always find him waiting patiently on the steps. In 2003, I met my wife Debra and she became a part the family, eventually becoming a doting mother to Rex. She would spend gobs of time laying or sitting on the floor playing and loving on Rex. There were times when I wondered if we were dating just so she could love on Rex. Debra did enjoy a feeling of safety from having Rex in the house. Rex was a very vigorous barker whenever someone approached the house doors. 2005 proved to be a transitional year for our family and Rex. Debra and I were married that year. Rex proved to be a very cordial host when we had family visiting. Later that year, we lost my dad and I received a promotion at work that resulted in my moving from Lincoln to North Platte. All during this time, Rex proved to be a loyal and invaluable companion for Debra since I had to commute between Lincoln and North Platte all week for the first 4 months of 2006. Finally in the spring of 2006, we were able to move permanently to North Platte. During this time, he took everything in stride. Rex grew old in our North Platte home; getting to run around in the huge fields at North Platte High School on walks and trips out to Lake Maloney to see the beach. Oddly enough, on these trips, he never had any desire to get wet swimming in the lake. Rex definitely slowed in his last year, but even as a 14yr old, he was still quite spry, running up and down the stairs, even though he would, sometimes, slide uncontrollably on our wood floors. During this time, he had a few extra trips to the vet, but had always managed to bounce back to his happy self. Still during the last few weeks we noticed that he was having more and more problems going up and down the stairs. Because of this, we began to limit his activities to the main floor of our home. Finally we noticed that he would spend inordinate amounts of time attempting to pee without really producing urine. It got to the point that he would strain his old hind legs enough that it was starting to affect his ability to walk. At this point, we had the vet check him out again and found out that he had a large growth in his bladder. From this, we and our vet decided that it was time for Rex to rest. Our vet handled the work with professionalism and compassion. Rex went very peacefully. Debra and I take comfort in know that Rex is now reunited with Grandpa and is probably enjoying some apples and some quality time in the garden with him. 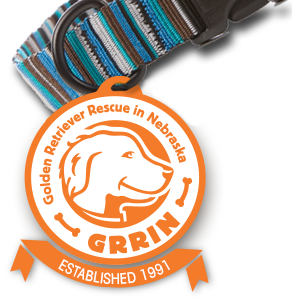 Thanks again to GRRIN for providing us with the opportunity to have Rex in our family. It is so immeasurable the joy you helped us and Rex achieve. p.s. Sorry, this seems a little long, but there was a lot to say about the 11 years we had with Rex.